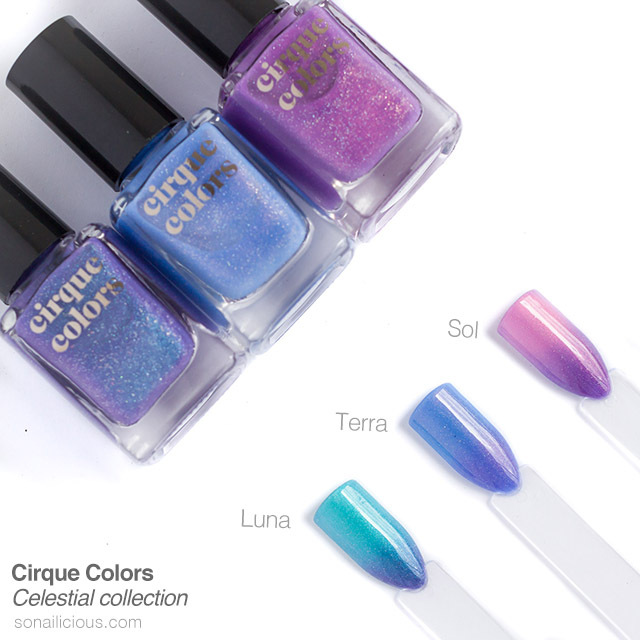 The new Cirque Colors Celestial collection is a trio of stunning thermal nail polishes – Terra, Luna and Sol that change color based on temperature. Inspired by the earth, moon and sun, these lacquers are infused with holographic sparkle and vibrant shimmer pigments that give them a unique, multidimensional finish. 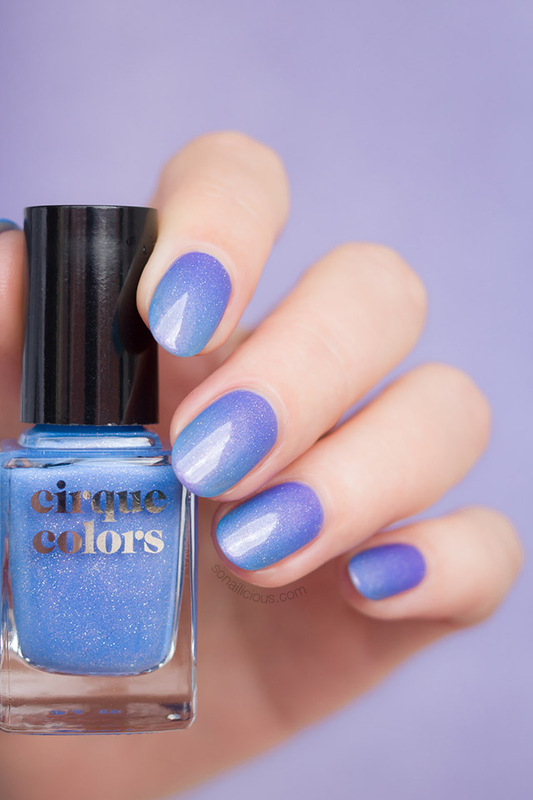 If you’ve been reading SoNailicious for a while, you’re already familiar with Cirque Colors. It’s a fantastic indie brand based in New York and they are well known for their revolutionary colours and unique effects. During my time at SoNailicious, I’ve seen a lot of nail polish and it’s really hard to surprise me, yet Cirque manages to amaze me every single time. Case in point, the Celestial collection! 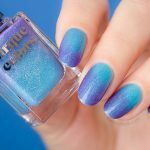 Now, enjoy the photos of these magical lacquers and read my detailed review below to find out all about their performance. 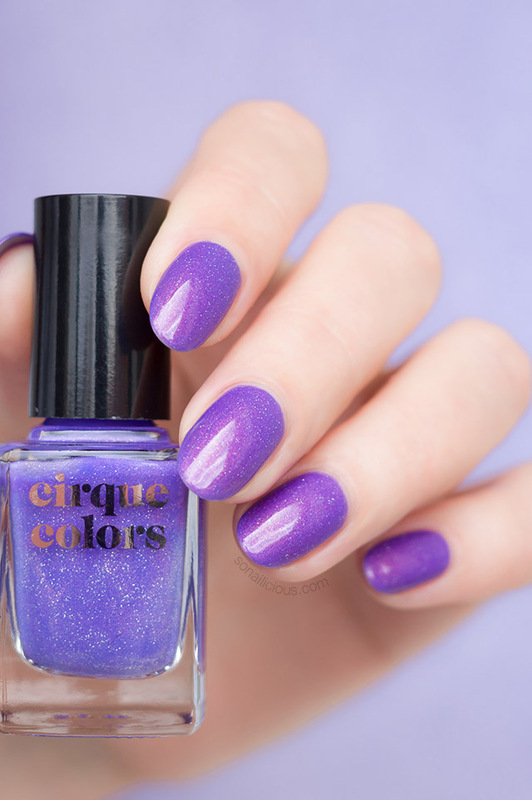 Formula: Cirque Colors Celestial nail polishes have a good formula which is relatively fast drying and very long-lasting. It’s 4-free and cruelty free. The polishes are moderately pigmented. You will need 3 good layers or 4 thin layers to get them fully opaque. I applied 4 thin layers – on tips and on nails*. Application: It’s relatively easy to apply. The nail polish dries relatively fast and yields in a perfectly smooth coverage without any streaks. Finish/Colour: These 3 nail polishes have the same semi sheet finish. When you apply first coat it’s very sheer but becomes progressively brighter with each coat, yielding in fully opaque finish in 3 – 4 coats. Nail Photos: Cirque Colors Terra. 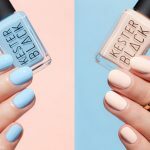 The other two colours – Luna and Sol will be showcased in separate nail art posts this week. 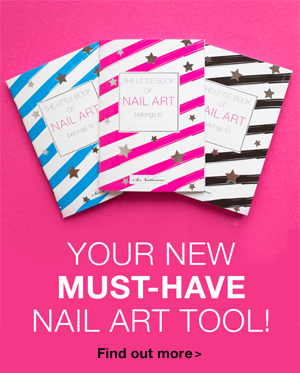 Nail Art: These polishes are not very pigmented and is best to be used as a base for nail art. Extra Notes: Like all thermal polishes, these Cirque lacquers dry to a matte finish. So I’d recommend to apply a layer of top coat for a glossy finish. Also, make sure you store thermal lacquers in a cool, dark place to preserve their colour changing properties. 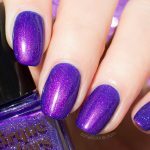 Dupes: There are no dupes for the Celestial collection. In my collection I could not find even anything close to these colours. 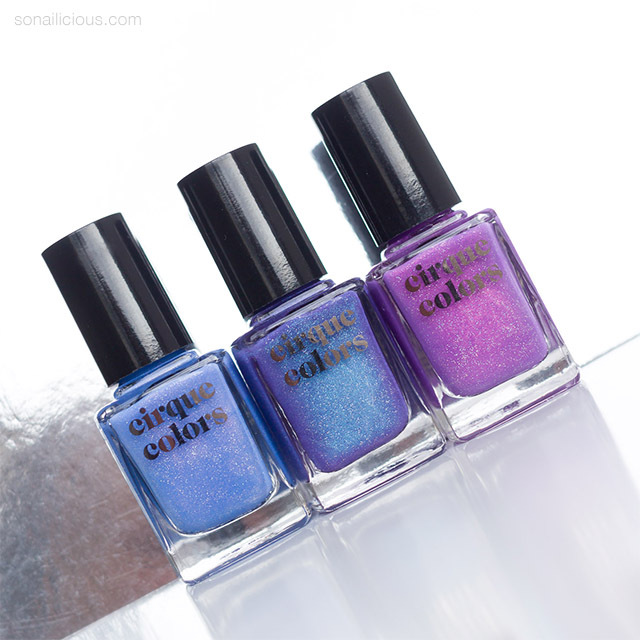 Overall Impression: Cirque Colors Celestial collection is a trio of stunning thermal nail polishes. With a beautiful shimmer, holographic sparkle and colour changing effects, these three polishes are destined to become a huge hit. 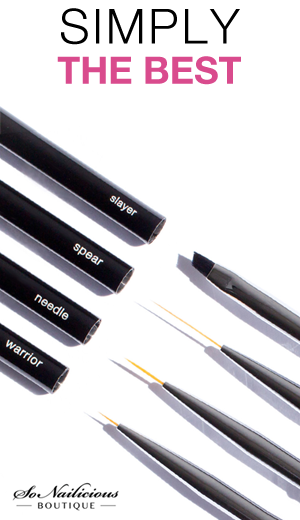 They are daring, fun and unique, and a must for every lacquer connoisseur. Especially, if you enjoy experimenting with your manicures. 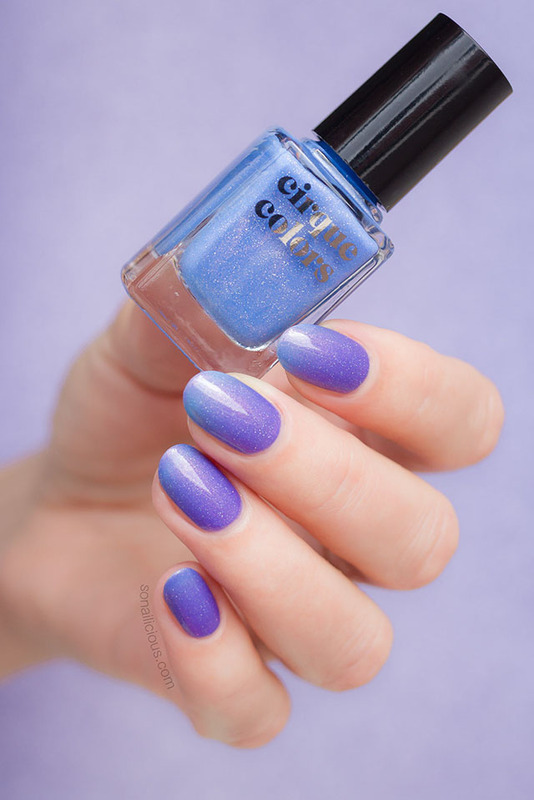 Where to buy Cirque Colors Celestial: available now here – $14 per bottle; Cirque ships worldwide. 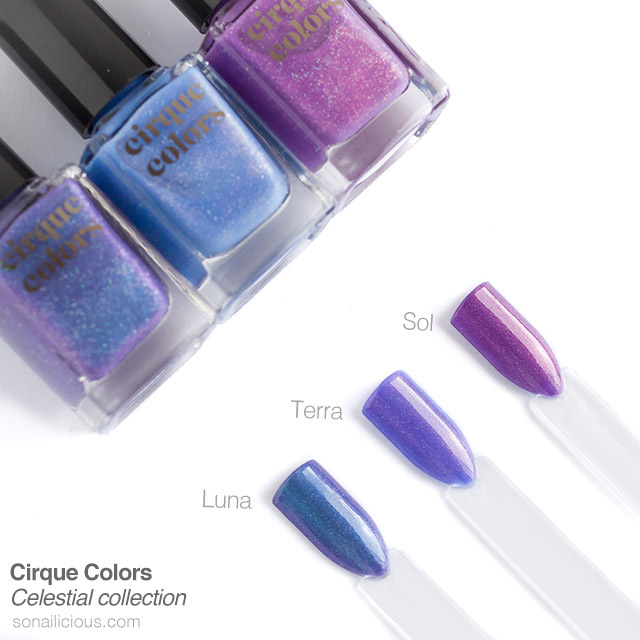 Do you own any of the Cirque Colors Celestial nail polishes? Which one is your favourite?